Stratton is the seat of Morley Township and is two towns east of Rainy River. The Township of Morley has the coolest city logo I think I’ve seen while compiling this site (see left). It looks like it was drawn in Microsoft Paint (much like this website), and features a sun, some waves, a maple leaf, what I think is a lunchpail (oops! it’s a silo! ), and a curling rock. If this isn’t the logo of a Canadian retirement town, then what is? East of town is the Kay-Nah-Chi-Wah-Nung Historical Centre (imagine having to spell that website address over the phone!). Located by the Manitou Mounds, it’s an ancient First Nations burial site that’s been commemorated with a historical centre. There’s the annual curling bonspiel in late February. And there’s another one in mid-March. And another one in late-March. And another one for truckers in April. There’s a fishing derby in July, and then another curling bonspiel in December. The area was first settled in the 1870s when settlers first travelled to Rat Portage (I bet Kenora sure is happy about changing their name from Rat Portage…) and then travelled by steamboat through Lake of the Woods. Fires wiped out the early town, but things were rebuilt and in 1903 Stratton became the seat of the township. 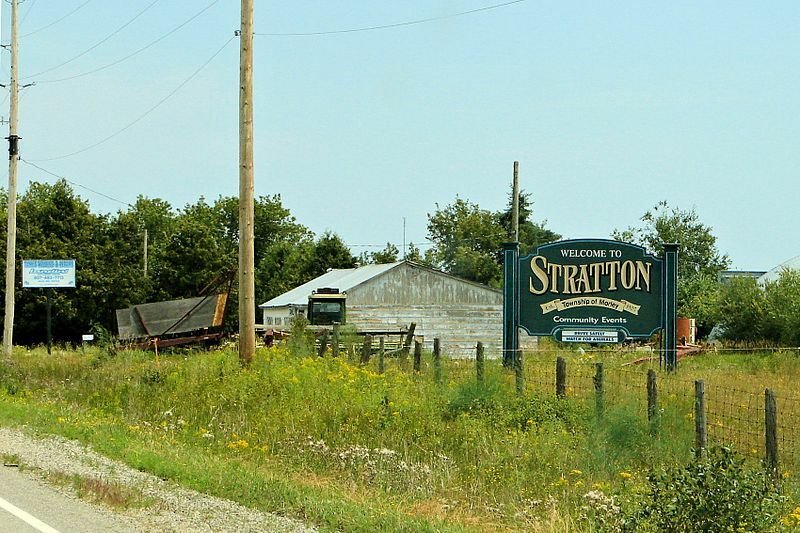 Today, Stratton is a bedroom community for Fort Frances and an agricultural area, with the only cattle auction/sales centre in north-western Ontario. This entry was posted in The Northwest and tagged boating, farm town, festivals, touristy stuff, waterfront by Highway11.ca Editor. Bookmark the permalink. I like the valuable info you supply on your articles. I’ll bookmark your blog and test once more right here regularly. I’m relatively certain I will learn many new stuff right here! Good luck for the following! Needed to post you a bit of word to help thank you so much once again relating to the amazing tricks you’ve contributed on this page. This has been really pretty generous with you in giving easily precisely what some people would have advertised for an ebook to make some bucks for themselves, most notably since you could have tried it if you desired. These techniques additionally worked to become a good way to comprehend some people have the identical passion just like my own to learn way more when it comes to this matter. I am certain there are some more pleasant times up front for individuals that examine your site. There was a property at 76 Kavanaugh Road, Stratton for sale. My wife and I can no longer find it on the wb and wonder if it is still for sale. We want to move back to Northwestern Ontario. Thank You for any information you can give us for properties for sale in the area. I just found your site and page on Stratton. Just wanted to give you a little infoÖthe ìlunchpailî in the logo is actually a silo to represent the strong farming heritage of the area. Our fishing derby is not in July but rather in may over the long weekend (this is walleye opener). We donít have an LCBO, but we do have a bar at the curling rink. Stratton has two schools, a general store, a full service gas station, a restaurant (well actually 2 if you count the restaurant at the mounds interpretive centre), there is a best start hub (family resource centre), a seniors centre and apartment building, a post office, only 2 churches, a forestry products and heavy equipment sales and service business, the districtís only cattle sales barn, a curling rink where some of the districts best curlers get their start, 2 outdoor skating rinks, a hall, and the best residents in the whole district. We do have quite a few curling bonspielsÖHalloween, Boxing Day, February open, Easter Open, Truckers and Loggers. We have an annual fall supper and of course our fishing derby. We have two playgrounds for the kids too. Hope this helps update your site. Anyone in Stratton know an Orval Dahlberg. He would be about 72 or 73, he also attended school at Minnehaha Acadamey in Minneapolis, Minnesota, circa 1954.